Cotabato Light and Power Company assures an stable and adequate power supply within its service area during the 2013 Barangay Election period. Though, there is power shortage in Mindanao, the demand of energy is expected to lessen since it is a holiday, and offices and big industrial companies are closed. Moreover, the company’s standby power plant is always ready to augment the power supply in case of power shortage. 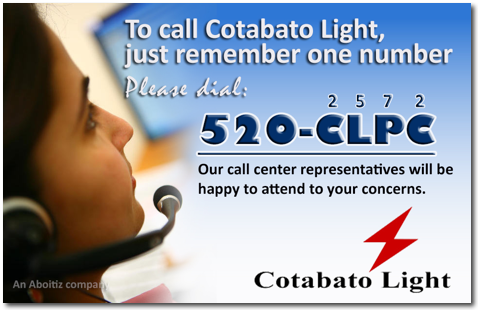 Everyday, there are lots of telephone call about customer inquiries, requests and complains received by Cotabato Light and Power Company (CLPC). Thus, prompt, courteous and accurate information are necessary to build better understanding and better customer service.